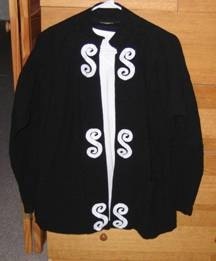 This beadwork is on a knit jacket I saw daughter-in-law Carolyn wearing at Thanksgiving. It includes bugle beads, seed beads, and wooden beads, all in copper tones. Immediately I knew I wanted to have something like it. That’s why I carefully photographed it. 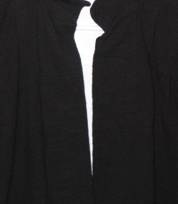 Soon after, I bought, or maybe I already had bought, a black jacket, sleeveless top, and pants from Deva. But I couldn’t do anything with this inspiration until I had finished teaching the two Elderhostel courses I’d committed to offer here at Charlestown. Here’s my jacket. It’s cotton Deva cloth, which is textured, kind of crinkly. 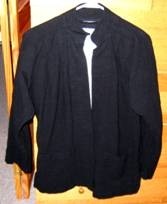 It has a stand-up collar, a two-inch-wide self-border down the front, and pockets. 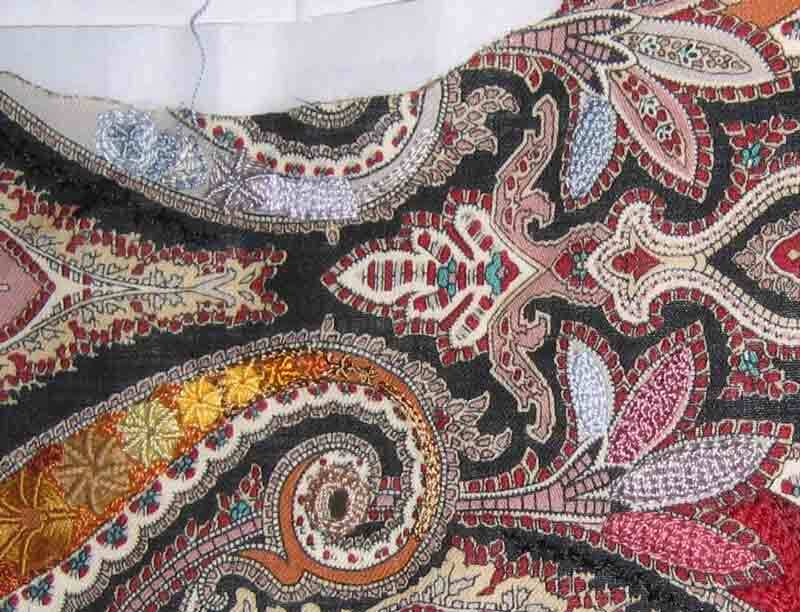 I plan to embroider the border, the tops of the pockets, the hems (or cuffs) of the sleeves, and maybe the collar, depending on the technical challenges that part may present. As soon as I’d done all the sample doodle cloths I needed for the class, I began gathering materials for the jacket, first from my stash, then online. 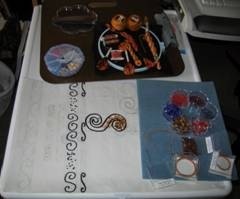 Here are some of the threads, beads, and copper metal threads I had on hand. You can also see some of my pencil and ink doodling. Looking for design inspirations in books that included beadwork, I decided that I wanted to use silk ribbon embroidery as well. While I waited for the ordered beads and ribbons to arrive, I began doodling with pencil and paper. It didn’t take long for my favorite shape—the S, to appear in my doodles, but it did take a while for me to figure out how to draw it so I could stitch it and how to make a border design featuring the spiraling S.
As soon as I had a fixed S shape, I transferred it to a doodle cloth for experimenting with threads, beads, and stitches. The effect I want to achieve is of copper-colored Ss when seen at a distance, but I want a lot of texture and shading to achieve that effect. 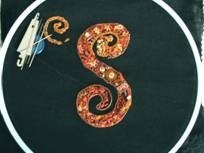 Here’s my doodle cloth showing a copper S on black linen. And even closer, you can see the variety of materials and stitches I’ve used. This is by no means what the final shapes, the final stitching, will look like. This is a doodle cloth. I’ve been trying out different ideas, seeking the look that most appeals to me. It isn’t finished. Also, I have not been able to get the color right in these photographs. 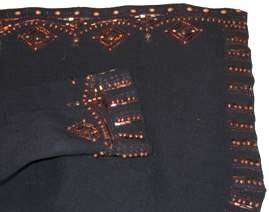 In reality, the darker stitches are less red, more copper-like. 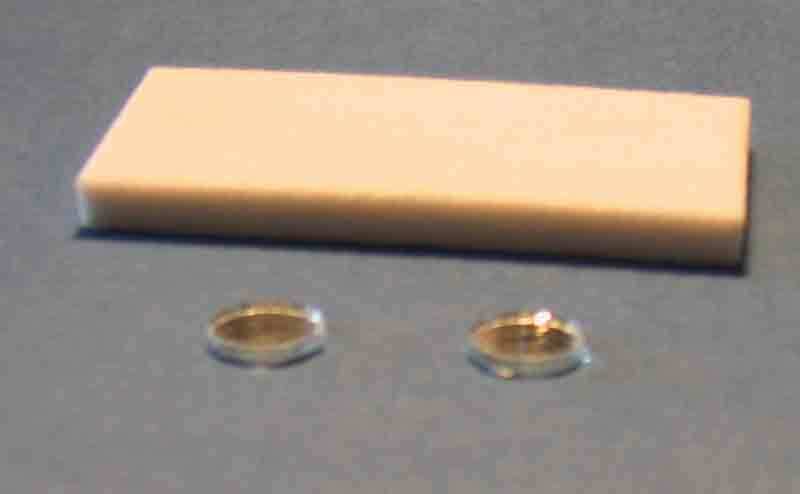 Despite appearances, there are no blue beads: all are copper-toned, or pearl, but some are iridescent. Now I think I know how I want to stitch these Ss–basically, at least. If I fill in six Ss in this textured manner, the project will probably take all year. And when I’ve finished working the Ss, I may not want the silk ribbon embroidery. Maybe just some copper beads. 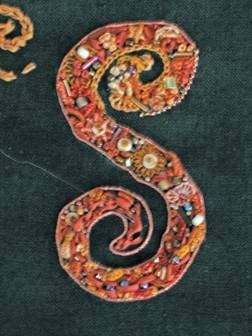 That’s okay: I’m working on something purposefully, knowing what I want to do, instead of just randomly, wildly, stitching. Although I’m not “normal” yet, I’ve calmed down quite a bit. Now I can finish a task I begin without jumping up to do something else. I still feel kind of panicky and tremulous at times, especially in the evenings. Then I do not feel good. But I expect that this, too, will pass. Here are the threads I’m working with on my improvisation. There have been others, already put away, but in the same colors. 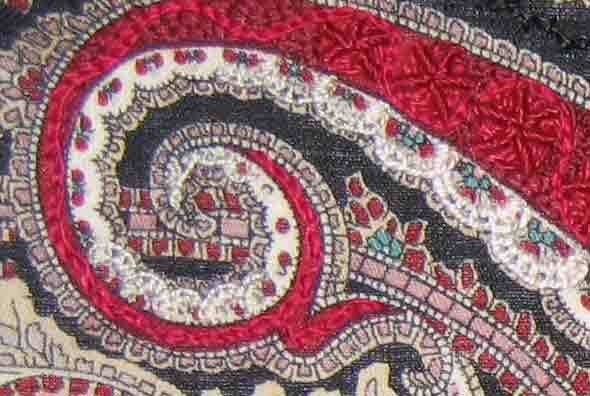 These include cotton in various weights, silk, rayon, rayon/silk, and wool. It struck me yesterday as interesting. The only primary color I’m using is red. No yellow or blue. They are present in the secondary and tertiary colors–green, purple, and orange in various shades and intensities. What kind of color scheme is this? Here it is, hanging on its too-small frame on my portable design board. I have two more wrapped rings to embellish, on the far right, and some more patches of sequin waste to treat in some way. I’ve used some of my homemade Sculpey beads. That was fun. Then, how am I going to tie the disparate parts together? I still don’t know what I’m doing! Just fooling around. On Wednesday Gloria gave me this gift of lace. It had been on the collar and sleeves of a dress she bought in 1941. 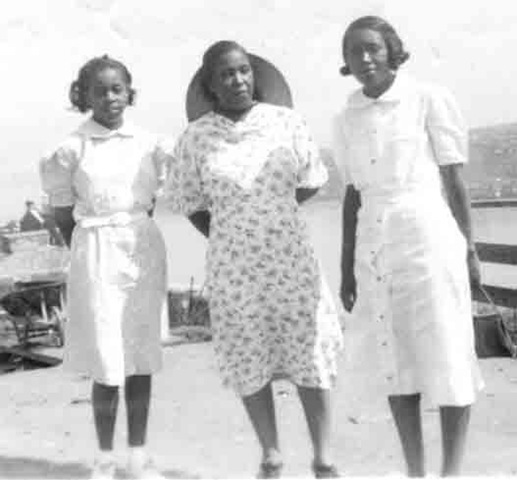 In September, 1940, following in the footsteps of two older sisters, Gloria became a freshman at Howard University, in Washington, D.C. Here she is as a freshman in a portrait taken at the studio of a famous photographer. Not yet 17, and the last child in her family, she was much younger than her siblings, and her mother dressed her as though she were 12. 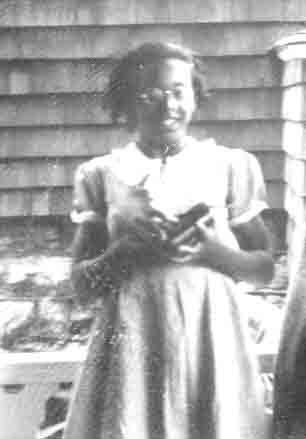 This is Gloria at 13, wearing the style of dress her mother favored for her. Notice the puffy sleeves and round collar. When her mother brought her to the campus, Gloria was wearing a pink, dotted-swiss dress with a bow tied in the back that was as large as the satin bow in her hair, knee-high white socks, and black patent-leather Mary-Janes. Until then, Gloria’s mother had chosen and bought her clothes, but now that she was away from home at college, she had her first real allowance–$8.00 a week. Naturally, she went shopping with other girls on 14th Street. In one of the shops, she saw a lovely black velveteen dress. 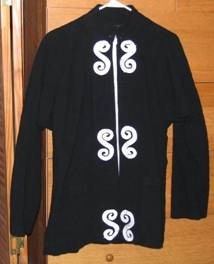 It had a collar and puffed sleeves of white-dotted black velveteen, giving a pinafore effect. 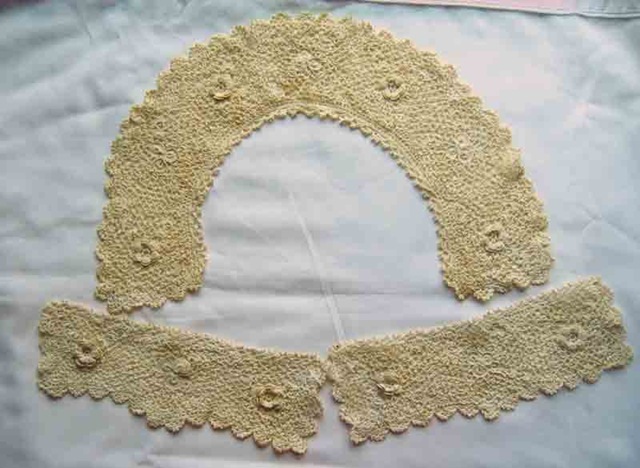 The lace was the edging on the collar and sleeves. Fortunately, her mother approved of the dress, mainly because she loved the lace. But it was also similar to dresses she had purchased for Gloria. 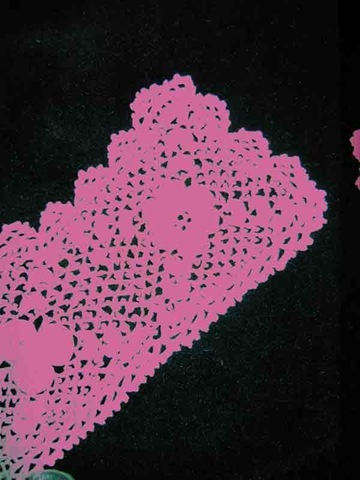 When she could no longer wear the dress—her first self-bought dress that she remembers with great affection, Gloria was unable to part with the lace, and she has kept it all these years. Howard University was and is one of the most prestigious historically black educational institutions in this country. For Gloria, it is the family school. 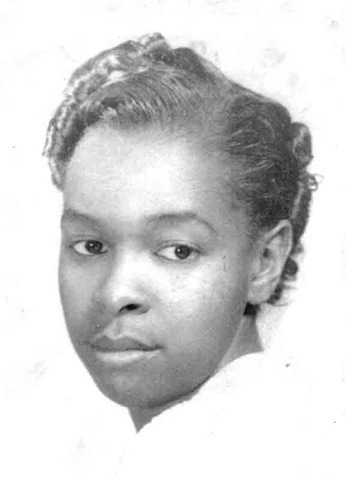 Her grandfather had been part of its early law school though she doesn’t know whether he graduated, and her father had taken some kind of religious course there after graduating from Livingstone College, originally founded as Zion Wesley Institute for the purpose of training A.M.E. Zion ministers. Not only had two of her sisters graduated from Howard, but the husband of her doctor sister and their two sons, as well. And an uncle who graduated in the first four-year class in dentistry. So now I have the lace from Gloria’s dress. What a treasure. Here you can see a bit of it up closer. Can you see the single petals strewn about? 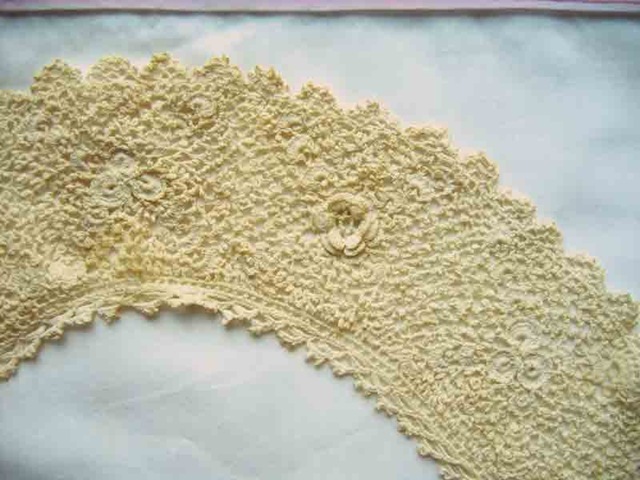 Does anyone recognize this lace? How was it made? 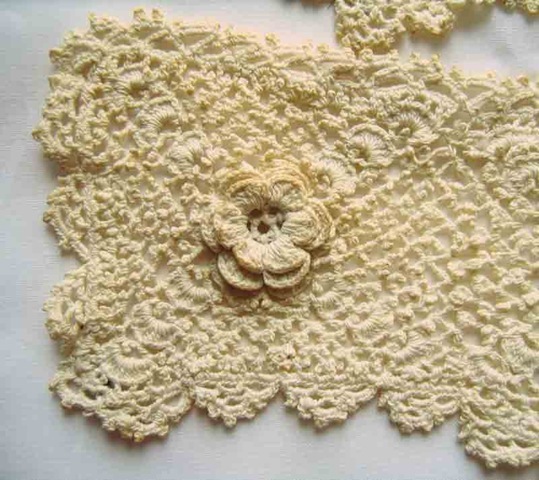 I know how to make raised, needlelace flowers, but I don’t know how they were incorporated into the lace. 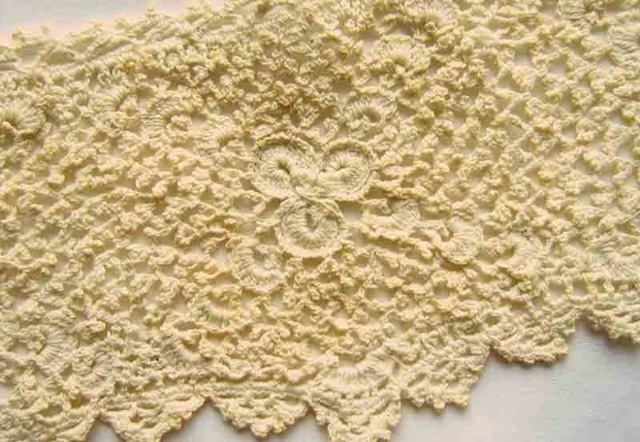 Please let me know if you have any ideas about how this lace was made. 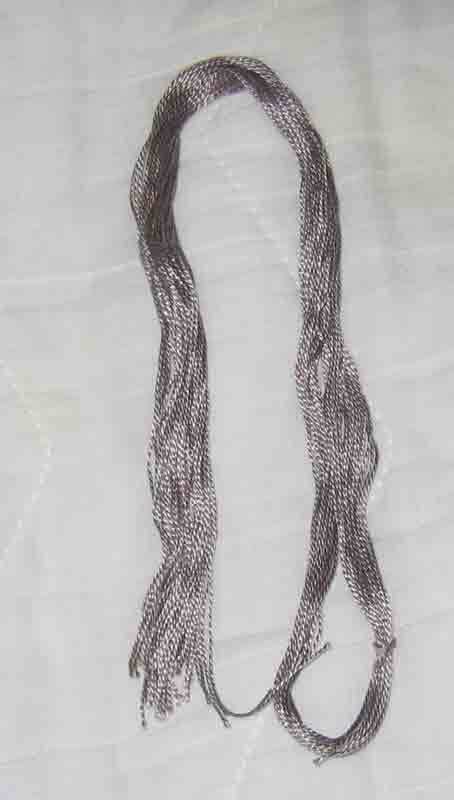 It will be such a pleasure to find a use for this lace, and I will be sure to show you what I do with it. Here are the threads I’ve bought so far for this jacket project. 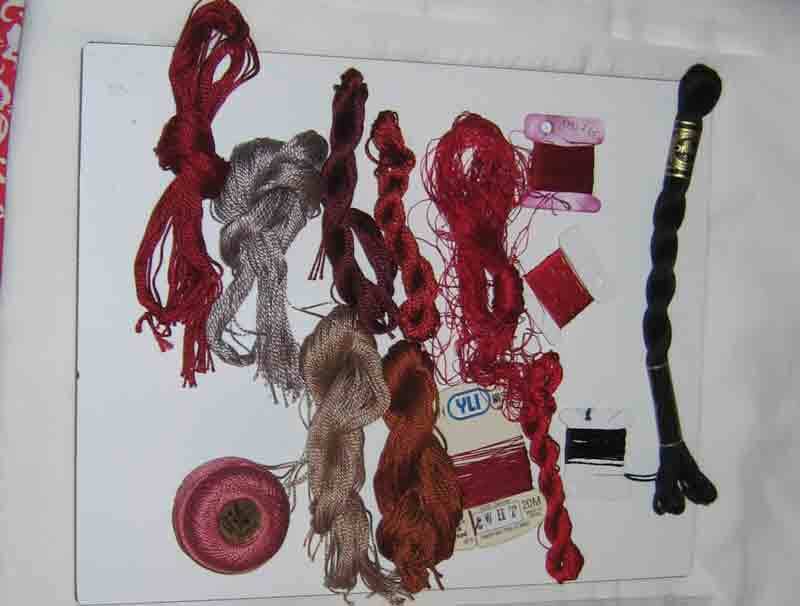 Actually, I ordered this Edmar thread pack mostly for stash, but also to fulfill a minimum order requirement with the Rajamahal Art Silk threads I wanted to check out for the jacket. It turned out that the turquoise or aqua beads in this pack are exactly the right color for the jacket, but not enough of them. 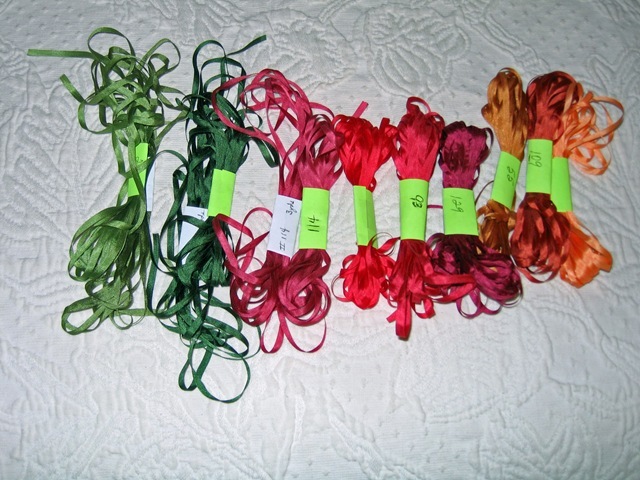 Here are the threads I already had on hand that might work, including the ones I dyed. Notice especially this gray thread. It’s perfect. Trouble is, I’m afraid I don’t have enough of it, and I can’t match it. It was given to me in a box of off-loaded stash from an EGA chapter after a member had read about my stitching history. It doesn’t come close to any DMC thread, and I have the thread chart, the real threads. I wouldn’t be so persnickety if I were not trying to match or complement the colors of the scarf. Even with all the threads I now have, I still don’t have the right grays. Here are my experiments on a remnant of the scarf that I’m using as a practice or trial cloth. I’m still trying to find just the right grays and off-pink/mauvish threads. The silk twist mauve is the perfect color, but I prefer the firmer lines of the pearl cotton. The silk is too soft. Here I’m trying out some off-whites for the scallops, for both size and color. Can you believe this? I’m about to place another order for threads–grays, pink/mauves, and off-whites, because either I don’t have the right color or the right size. 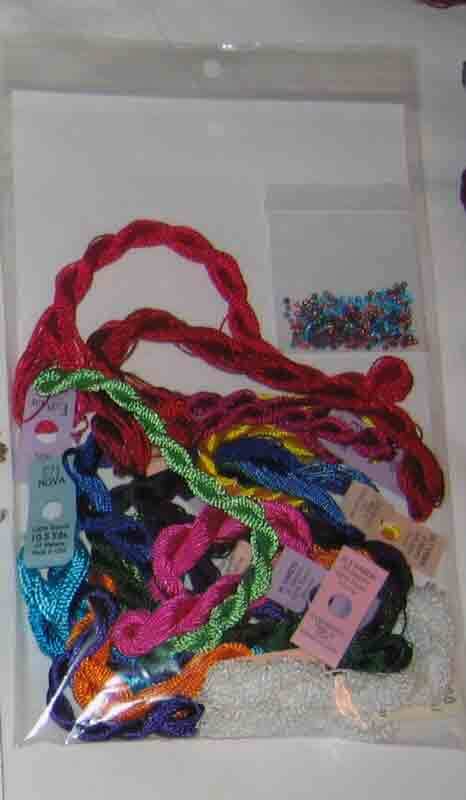 And yesterday I ordered beads, after finding that I didn’t have enough of the right size red ones, either. Of course, I had to order enough to fulfill a minimum order requirement. It wasn’t that I was working above my skill level. 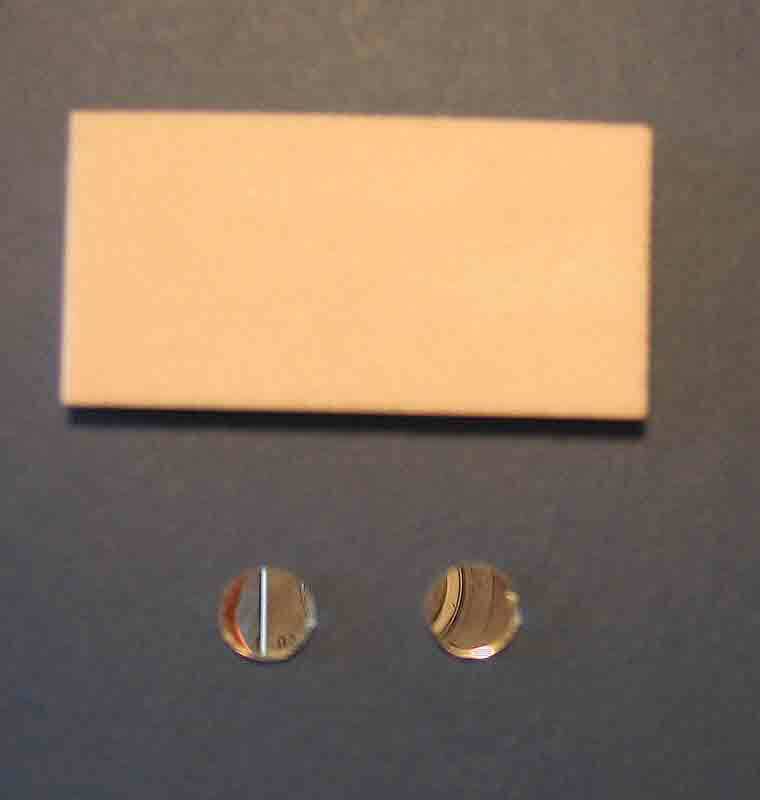 I was working with tools and materials below quality level. What a difference having the right tools makes. And yesterday my order arrived. I’ve shown you the home-made velvet cutting board I’ve been using to cut the gold purl, and you’ve seen the purl I was using, as well as the sadi and rough purl for practice. All of it was old, on-hand. Below are the cutting board, the tweezers (sold for goldwork, years ago), the old embroidery scissors I had relegated to metal cutting, and some of the old purl. I think you can see that it won’t lie straight and it has kinks in it. This is the kind of stuff I was trying to cut into precises lengths. Here’s my new equipment: a purpose-made cutting pad just for gold and beads, finer tweezers, and the fine scissors I can now use for cutting metal because my new embroidery scissors arrived yesterday. These scissors, as you can see, have much finer blades for greater precision in cutting tiny bits of purl the same length. Already I can see how much more easily I can cut the right size purls and stitch them over the padded S. And, of course, the felt helps, too. Here are the rest of the gold threads I received yesterday. After getting a shipment of silk threads three days ago, I am feeling really RICH! You’ve had a chance to see my work space between projects, all neat and tidy. It doesn’t look like that now. Can’t wait to get back to work. My needle is threaded.